"Vodka replaces gin in this variation of the classic martini. 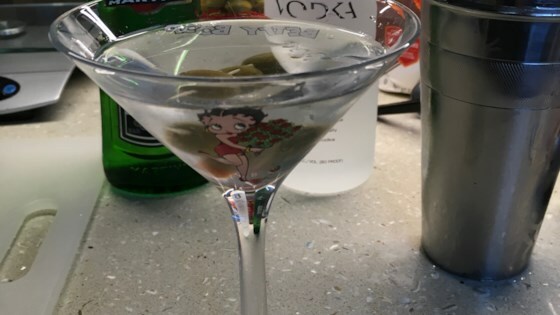 Shake until ice cold and serve up in a chilled martini glass." Combine vodka and dry vermouth in a cocktail mixing glass. Fill with ice and stir until chilled. Strain into a chilled martini glass. If you prefer, you can garnish your vodka martini with a lemon twist instead of olives. Perfect Martini! I also like to add a dash of the olive juice. YUM Be sure to use good quality vodka. thank you for sharing a basic martini recipe! I had to wade through dozens of sweet or gin recipes to find the perfect one! Perfect, simple vodka martini recipe. First time martini drinker (my wife) liked it. Use a high quality vodka - I used Russian Standard Platinum. Easy, tastes great. I have been using this recipe for many years. The secret to a good Matini is good Vermouth with any Vodka or Gin. Followed the ratios to make two Martinis, no olives, added a 1/4 tsp of lime juice for the 2 x beverages. Makes for a great Friday night relax!